Ottogi Co., a leading food company in South Korea, vowed to continue being devoted to its corporate social responsibility programs. 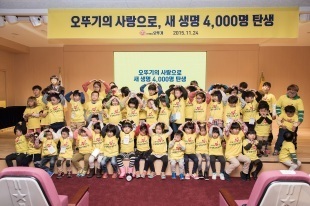 Seoul-based Ottogi has been running several CSR programs since 1992. It started with providing support for five children with cardiac disease every month which has expanded to include 23 children now, the company said. The company has also funded cardiac surgeries that saved 4,000 children. The company also provides employment opportunities for the disabled through Goodwill Stores operated by a nonprofit organization that runs a school and rehab center for the disabled. Employees of the Goodwill Stores assemble Ottogi products so that they can be sold as gifts. Ottogi also runs other CSR programs including a volunteers group consisting of its employees, a scholarship program for underprivileged students and food assistance for elderly people living alone.